Boy bands and teen pop bands are a dime a dozen and have been for the better part of two decades. When not done well, it can be embarrassing, cheesy and just hard to listen to, however when done well it can be one of the most fun and catchy things around. 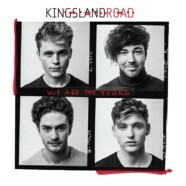 That’s exactly what you get with Kingsland Road’s We Are The Young. Hailing from the UK, the comparisons to One Direction are bound to start coming in soon if they haven’t already, but it doesn’t take long to figure out they’re a far cry. With Kingsland Road, we get a more raw and mature pop vibe. The music has a more alternative/rock-based undertone and, while vague- the rock elements set them far apart. From the very beginning with the title track, the band has a more alt-feel than anything and also has a strong anthemic feel to it while “Misbehave” kicks off with a rock-fused guitar and bass line that will make you start dancing whether you like it or not. This one’s a dance party. It’s also with this song that we see Kingsland Road has a more adult-oriented lyrical approach than other boy bands. Lead single “Dirty Dancer” is one of the catchiest songs on the album and, even if you don’t wanna admit it, will make you start moving wherever you’re sitting while “Freedom” will just make you smile and put you in a good mood. Much like “Freedom,” “Shoreline” has an almost-R&B opening feel to it before jumping to a dance-oriented frenzy. In the end, Kingsland Road have put a fun spin on the pop/boy band genre. You can’t listen to this album and not feel good.